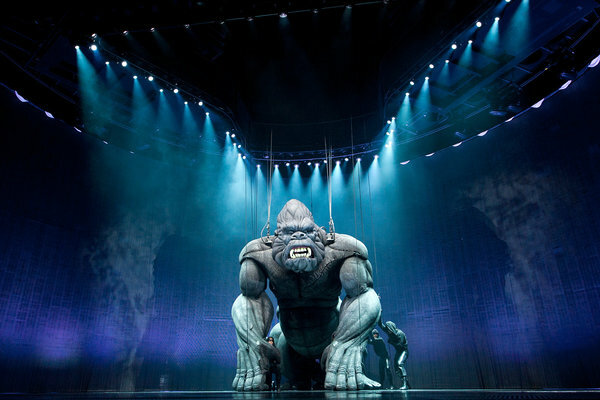 The massively budgeted King Kong musical, expected to move to America this year, has delayed its Broadway opening and will have to switch theaters. Having completed its Melbourne run in February, the show was supposed to reopen in New York this December in the same theater that housed Spider-Man: Turn Off the Dark. But the NYT reporter speculated that Spider-Man’s $60 million loss was too fresh in mind and Kong’s producers didn’t want to labor under the associations caused by opening another effects-heavy musical production in the same house. Meanwhile, that theater has been booked by another musical, a revival of On The Town. This entry was posted in Like Show Business and tagged King Kong by Mike Glyer. Bookmark the permalink. Cirque du Soleil featuring Rob Ford. Yes, the songs “I love bananas, but want to peel off your dress”, “You’ve made a monkey out of me”, “Impossible to love”, “I can’t carry your child”, “You eat crackers in bed”, “We’ll adopt a love child”, “Ain’t no building tall enough” will be hummed, played endlessly on the radio and it will be made into a video game. The film will be directed by Ewe Boll.